I'm not sure if I should say I'm exhilarated (which I am!) or exhausted (I'm that too!). After a long weekend in Salt Lake City, hobknobbing with other pet bloggers, pet company reps and social media experts, my brain is bursting with new things to try. Now all I need is a couple dozen assistants and I could probably show TreeHugger a thing or two--LOL! Oh well, since the assistants are probably not happening, I'll just continue on this same path, adding a few improvements and tweaking as I go. I hope you all enjoyed the Weekly Wag this past weekend and are looking forward to a holiday week with your families next week. For now, let's just review our past week's posts. 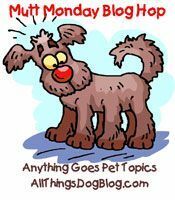 I invite all pet bloggers to link up their pet posts here. Join in the fun and share the linky list on your blog as well. Need help? Drop me a line at AllThingsDogBlog@gmail.com. Happy Mutt Monday!